Carpool Karaoke: The Star Trek: Discovery Episode! Carpool Karaoke – The cast of Star Trek: Discovery – Photo courtesy of Apple. The stars of Star Trek: Discovery are featured in today’s episode of Apple TV’s Carpool Karaoke. Check out the trailer below. Star Trek: Short Treks Beams Up In October! Star Trek: Short Treks is a series of four stand-alone short stories highlighting three familiar characters – Ensign Tilly (Mary Wiseman), Commander Saru (Doug Jones), and Harry Mudd (Rainn Wilson) – and a new character, Craft (Aldis Hodge). The four-episode series will begin rolling out on October 4th. Episode taglines and a teaser trailer follow. Comic-Con 2018: Try to Ruffle a Few Feathers Trailer: Star Trek: Discovery – Season Two! During a panel in Hall H at Comic-Con 2018, Trekkers were dazzled by the first look trailer for season two of Star Trek: Discovery – in which we meet Captain Christopher Pike of the U.S.S. Enterprise and, get our first tease about Mr. Spock (who may be connected to a potential new danger). The CBS All Access series returns in early 2019. The Shape of Water – Guillermo del Toro’s Romantic Fable Soars! The shape of Water – Elisa Esposito (Sally Hawkins) and the Amphibious Man (Doug Jones) – Photo by Kerry Hayes/Courtesy of Fox Searchlight. There are noticeable elements from Beauty and the Beast, Creature from the Black Lagoon and even Splash to be found in Guillermo del Toro’s The Shape of Water – but filtered through del Toro’s unique imagination the film is far more than the sum of its parts. Star Trek: Discovery: Chapter Two Gets Premiere Date! Where is Disocvery Boldy Going Trailer: Star Trek: Discovery! Star Trek: Discovery – Michael Burnham (Sonequa Martin-Gree) – Photo courtesy of CBS All Access. The first two episodes of Star Trek: Discovery introduced Starfleet First Officer Michael Burnham; set the stage for the Federation/Klingon War and left mutineer Burnham in prison. What happens next? Well, let’s just say that Burnham is tortured by the consequences of her actions – but that doesn’t stop her from being a fierce fighter. New episodes of Star Trek: Discovery premiere on CBS All Access Sundays (8:30/7:30C). MOVIE REVIEW: Hellboy II: The Golden Army Is Glorious Fun! 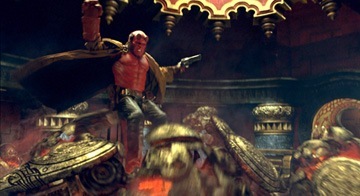 Although technically not a superhero movie, Hellboy II: The Golden Army is one of the most beautifully visual films of this or any other year. It’s also a combination of a lot of genres: comic book movie, action flick, fairytale, horror story, eco-fable, romantic drama, pulpy noir, FX flick. The thing is, because of writer/director Guillermo Del Toro’s love of the characters, and his amazing visual sense, all of these genres fuse into a whole that is ever-so-slightly greater than the sum of its parts. Hellboy [Ron Perlman] and Liz Sherman [Selma Blair are together in this film – a situation that is more a bit awkward. As Abe Sapien [Doug Jones] puts it, “They have their good days and their bad days… and their really bad days. Complicating matters are Hellboy’s longings to go public – FBI liaison Tom Manning [a woefully underused Jeffrey Tambor] is particularly put out by a photo which the big guy posed for… and autographed! Into this chipper little situation comes an elvish prince named Nuada [Luke Goss], who wants to raise the legendary Golden Army to destroy mankind as mankind has been replacing nature with shopping malls and parking lots. His twin sister, Nuala [Anna Walton] is dead set against this and flees – encountering Abe in the Troll Market [think a fusion of the Star Wars Cantina and the Floating Market from Neil Gaiman’s Neverwhere], where he helps save her from a troll. Everything escalates from there. Perhaps The Golden Army’s greatest asset is Del Toro’s amazing visuals. All of the film’s creatures are beautiful [sometimes in very disturbing ways] and the sets are enthralling. The creatures are mostly practical and the prostheses and animatronics are absolutely state of the art. Of course, they wouldn’t mean anything if the story and the characters didn’t support them – but they do. The film is probably hardest on Abe, who encounters romance for the first time in his life, but the Hellboy/Liz relationship takes some interesting and powerful turns as well. Then there’s the new kid on the block, Johann Strauss [voiced by Seth McFarlane], a Teutonic being of ectoplasm housed in an encounter suit that resembles the old spider-Man villain, Mysterio. Brought in to bring Hellboy to heal, Strauss shows some unique abilities, but can’t contain the curmudgeonly demon. Del Toro shows that Pan’s Labyrinth was no fluke as he sets up action sequences and emotional situations that are simultaneously larger than life and as real as oxygen. He puts his characters through trials of epic proportion, while keeping their feet firmly on the metaphoric ground. The only real flaw of the film is that it may be too rich, too full. There’s so much going on – on every level – that it’s hard to get it all in one viewing. The cliché, “I laughed. I cried. It became part of me,” may actually apply here – Hellboy II: The Golden Army has an effect that lingers long after you’ve left the theater.